It's always funny to jump in the past and see how the business that someone started a long time ago are still up and running and "pretty modern". 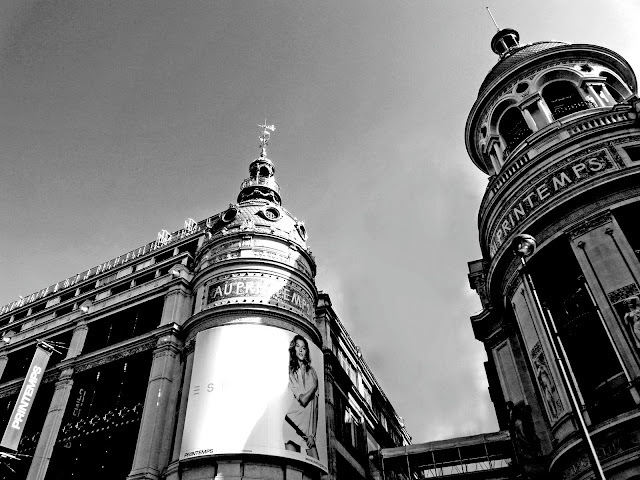 That is the case of Le Printemps, one of the first Paris department stores created in May 1865 by Jules Jaluzot and Jean-Alfred Duclos who took the risk of investing in an area that was not very popular then. Only they believed that the new Saint Lazare train station would change all this, and they were right! They also "invented" fixed prices; for the first time customers would not have to bargain each time they wanted to buy something, simply pay the price on the label. How revolutionary! There are times I wouldn't mind seeing the return of bargaining, but I suppose today's constant stream of "sales" are a sign that stores, too, haven't given up on the idea of bargaining with their customers! I remember going to 'Le Printemps' for more upscale items, yet the amicable 'Samaritaine' always makes a wonderful weekend of rich conversations and gentle strolls. Thanks, Eric, for featuring one of the Pinault establishments. I was at the Punta Della Dogana earlier on. A great book about the first Parisian department stores is "Au Bonheur des Dames" by Zola. I saw Printemps in my mind when I read it, although I think it was based on Bon Marche. Good photo, and very interesting history! This is amazing. Im glad this is still around. I love this picture. Only you can make a store look glamorous. Now if you could make my credit card bill do the same I'll be your bestest friend. Majestic building, majestic prices (but worth it!). Shopping SHOULD be an event, not a "click" and "check-out" experience. Great image and interesting story! Beautiful building & great photo - J'adore Le Printemps! @Keat "Thanks, Eric, for featuring one of the Pinault establishments. I was at the Punta Della Dogana earlier on." Actually I think Pinault sold Le Printemps now. @Winski "ESPECIALLY at Christmas... The place is magic..." Yes, I agree! @Mrs Vandertramp "A great book about the first Parisian department stores is "Au Bonheur des Dames" You're right, I love it even though it's also a sad story. @Alexa " I also love to bargain, so I guess I'll have to do my shopping aux Puces. :~}" True, but you might end up paying more LOL! @Michael "Majestic building, majestic prices (but worth it!). Shopping SHOULD be an event, not a "click" and "check-out" experience." Traffic, parking tickets, endless lines, outrageous prices, useless purchases... Yes, shopping at Le Printemps is surely an event! This is an interesting photograph and post. I would enjoy wandering the aisles of such an impressive establishment. But for me, experiences are more important than possessions. I have some great photos of the construction screen that covered the facade for several years. The facade was printed on the screen, including the reflection of the Opera Garnier. Eric: do you really need to drive to le Printemps? You go to the club, you have a bicycle, you live about a kilometer away and the nearby Metro takes you right there. Of course, the "useless purchases" are...whose fault?...but "Traffic, parking tickets..." Beu deu geu deu, Pfft! How exhausting, to have to 'bargain' for each and every purchase! @Eric "Actually I think Pinault sold Le Printemps now." What? I'd love for him to own the place, still. It's beautiful. How many new stores have such lovely buildings? Not around here, they don't! And now, we try to argue the price on the label! ;) Still it's good to see some things do stand the test of time. I miss the Samaritaine.